Fidelity already dipped its toe in the cryptocurrency market. Is it ready to take the full plunge? Last August, Fidelity CEO Abigail Johnson followed through on her avowed interest in cryptocurrency and blockchain technology when Fidelity’s website implemented an option to display bitcoin, ether (another cryptocurrency that uses the Ethereum blockchain platform) and litecoin holdings for retail investors with a Coinbase account. This week, Johnson launched a new company, Fidelity Digital Asset Services, which will provide custody and trade operations for institutional traders investing in cryptocurrencies. “We expect to continue investing and experimenting, over the long-term, with ways to make this emerging asset class easier for our clients to understand and use,” Johnson said. The new division is led by Tom Jessop, a former managing director at Goldman Sachs who previously served as president of Chain, a tech startup that builds “cryptographic ledgers that underpin breakthrough financial products and services,” according to its website. To start, only professional traders and hedge funds will have access to the platform, which will initially feature just bitcoin and ether, the two largest by market capitalization, before adding support for other digital assets down the road. While there are many retail service providers, Fidelity has identified a business opportunity in the lack of support for institutions, something the fund company has decades of experience providing in the financial services industry. And Digital Asset Services isn’t a skeleton-crew startup. The business launched with 100 employees, including dedicated client service reps. And it comes backed with years of internal research in the digital asset sphere. In 2013, Fidelity started investigating digital assets in its “Blockchain Incubator” and has tested trading with digital ledgers. It also began accepting bitcoin as donations in Fidelity Charitable, an independent public charity, in 2015, and even accepts bitcoin for payment at the cafeteria in its Boston headquarters. In our view, creating this new division shouldn’t necessarily be viewed as a vote of confidence in bitcoin but rather a vote in favor of the credibility of cryptocurrency as the currency of the future, as well as the underlying technology—two areas where Fidelity wants to lead rather than follow. We still see bitcoin as more of a wager than an investment, and we recommend investors only spend as much as they can afford to lose—while it may be a worthwhile investment in the future, it looks more like a speculative gamble to us today. And we would never recommend gambling with your life savings. For more on our take on bitcoin and cryptocurrency and its history thus far, please read our Special Report, Betting on Bitcoin: Investment or Gamble. We are proud to present the latest episodes of The Adviser You Can Talk To podcast! “When Should You File for Social Security?” features Account Executive Dina Milne and Senior Account Manager Alec Rosen. In the first of a three-part series, Dina and Alec discuss the basics of Social Security and what to consider in deciding when to start taking benefits. Click here to hear our Social Security podcast. “Health Savings Accounts: Triple Tax-Advantaged Investing” featuring Account Executive Kari Wolfson and Financial Planners Victor Colella and Andrew Busa. This trio of planning professionals discusses the potent tax benefits of health savings accounts (HSA’s) and how they can be a part of your wealth management strategy. Click here to hear our HSA podcast. You can listen to all of our podcasts on our dedicated Adviser You Can Talk To podcast website as well as on other popular podcast hubs (Apple Podcasts and Google Play among them). Enjoy them at your convenience and subscribe for instant access to new episodes as soon as they become available. And if you have any questions about either topic or ideas for future episodes, don’t hesitate to call or email us. Thanks for listening! Countless investors were left shaking their heads last Wednesday as they watched the market sell off for no discernable reason. By the close of trading on October 10, the Dow had fallen 832 points, down 3.3%, with headlines about jittery investors on front pages of news sites and TV chyrons around the world. But to us, and innumerable other Vanguard investors, there was a bigger story than a market drop: Vanguard’s failure to allow investors to trade as the selloff was underway. On a day when the Dow and S&P 500 index both dropped more than 3%, Vanguard’s website failed. (Adviser Investments was not impacted by the outage.) 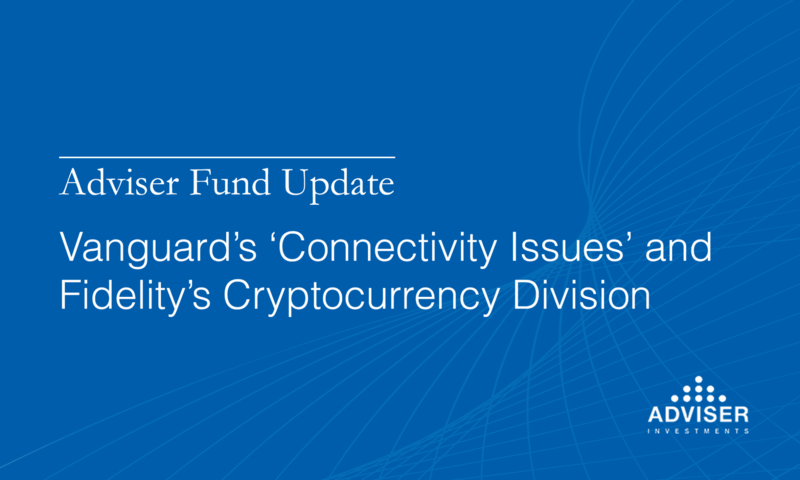 The fund titan blamed “a network connectivity issue” in a tweet Vanguard repeatedly sent out in response to clients who themselves tweeted about their inability to log in or trade. Vanguard’s meteoric growth has certainly brought benefits for investors in the form of expense ratios that continue to edge closer to zero. But the company’s technology has struggled to keep pace with the flood of new money and clients as the popularity of low-cost index funds has soared. With $5.2 trillion under management (up from $4 trillion just 18 months ago), it’s become apparent that the firm is hitting a service wall. McNabb didn’t put a number on his technology spending. Nor did Tim Buckley, Vanguard’s current chairman, when interviewed earlier this year about the raft of service problems the company has experienced in recent years. It wasn’t until the firm began to run damage control following the October 10 debacle that Vanguard revealed it spends 27% of its operating budget on technology, and that it has increased spending in that area by an average 11% each of the last five years. On the surface, those are encouraging stats, but the money spent clearly did not deliver on the promised convenience or “enhanced experience” on a heavy volatility day when people were denied access to their accounts. Competitor Fidelity has not been shy about giving numbers. Barron’s recently reported that Fidelity is spending $2.5 billion a year on technology. Billion, with a “b.” That’s an impressive number, and one reason we custody many of our client accounts with the Boston fund behemoth. Earlier in October, Fidelity announced that Charles Morrison, president of the firm’s asset management division, will retire at the end of the year after nearly five years on the job. Since taking the position in February 2014, Fidelity’s assets under management have increased 37% to $2.7 trillion. Morrison is a Fidelity lifer, having joined the firm as a corporate bond analyst in 1987 after earning his MBA from Harvard Business School. He began managing trust accounts in 1990 and was promoted to vice president of Fidelity Management Trust Company in 1992. During this time, he was responsible for managing a variety of short-term and broad-market bond portfolios. From 1995 to 2002, Morrison managed a handful of Fidelity’s bond funds, including Short-Term Bond, Spartan Short-Term Bond and the Advisor Short Fixed Income fund. He also managed the fixed-income sleeves of the Asset Manager and Asset Allocation series of funds. In 2002, Morrison took on his first leadership role at Fidelity, overseeing several strategic projects for the company and as head of the Bond Group. From 2004 to 2009, he served as president of Fidelity’s Money Market Group, before becoming president of its fixed-income division. Fidelity says it expects to name Morrison’s replacement soon. We doubt that investors in the firm’s funds will see any changes as a result of his departure, and Fidelity’s track record of successful succession planning suggests that business will go on without a hitch once Morrison has left the building. Vanguard Risk Leader Named; Manager to Step DownRebalancing: What Do the Numbers Say?